Russia Says U.S. Cyberattacks Show A Need For Its Own Internet Spokesman Dmitry Peskov links the attacks to Russia's need for its own Internet. It is a "geopolitical angle to try to defend their own steps," says Internet freedom expert Sanja Kelly. Russian President Vladimir Putin's spokesman Dmitry Peskov, after a 2018 presidential awards ceremony in Moscow. On Wednesday, he said the U.S. has carried out a number of cyberattacks on Russian organizations and people. Last year, the so-called "troll farm" and 13 people were indicted for interfering in the 2016 U.S. presidential elections after being charged by special counsel Robert Mueller. One of the individuals, Yevgeny Prigozhin, who is nicknamed "Putin's chef," was indicted on charges that funded the operation through his catering company. The U.S. Treasury Department imposed sanctions on the group a month later. Prigozhin denied involvement in the Internet Research Agency. The Kremlin has denied influencing elections in the United States. 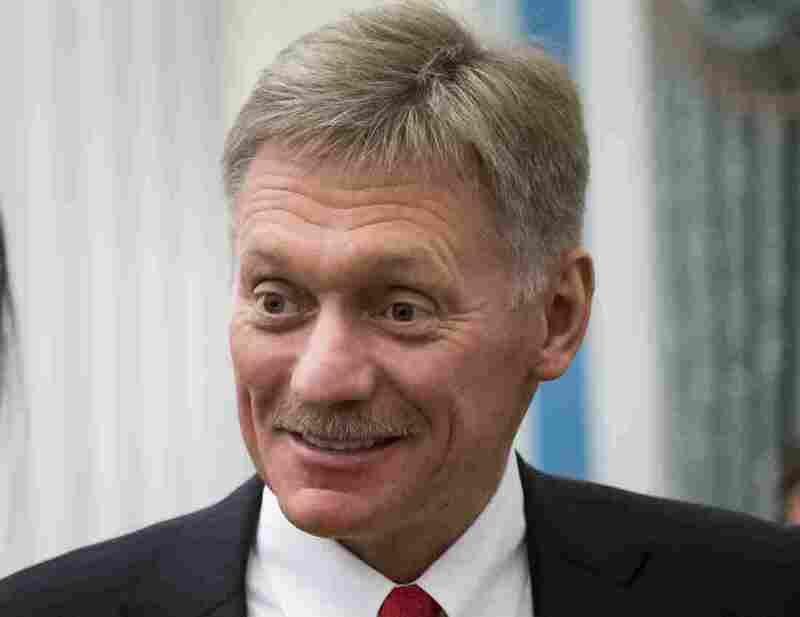 Peskov also spoke to reporters about Russia's exploration of an independent Internet, as foreign countries try to isolate the Runet, or Russian Internet. Legislators proposed a test into whether server data could be rerouted internally to evade interception, as opposed to being sent abroad. Referring to the cyberattacks as "potential threats," Peskov said that Russian lawmakers are in the process of passing legislation, "like the so-called sovereign Internet bill." Lawmakers recently voted for the bill to let the Runet function autonomously during a national emergency, NPR's Moscow Correspondent Lucian Kim reports. Sanja Kelly, the director for Internet Freedom at Freedom House, a democracy watchdog organization, says it's a justification for the authoritarian regime's next repressive move. "They are using this geopolitical angle to try to defend their own steps. But in reality it's generally just the pretext for censoring the Internet even more so than in the past," Kelly tells NPR. "Particularly following the in-depth investigations into the Russian hacking of the DNC here in the United States, and also Russian disinformation campaigns, the Russian government is more generally concerned about retaliation," she adds. For years, the Russian government has been looking at China's Great Firewall as a model for control in the digital sphere, Kelly says. Peskov made international headlines earlier this week, after RFE/RL reported that his daughter is interning in the European Parliament in Brussels. She works for right-wing parliamentarian Aymeric Chauprade, who publicly condoned Russia's annexation of Crimea in 2014 and was a member of Marine Le Pen's National Front political party in France. "We are talking about an ordinary student and an ordinary internship," Peskov told the outlet after the report published.